The Eli Whitney Productivity Award specifically recognizes an individual for distinguished accomplishments in improving capability within the broad concept of orderly production. For more than 80 years, the Society of Manufacturing Engineers has been recognizing individuals from industry and academia for their contributions in manufacturing technologies. Dahotre has been continuously working in the field of laser processing for more than 25 years. 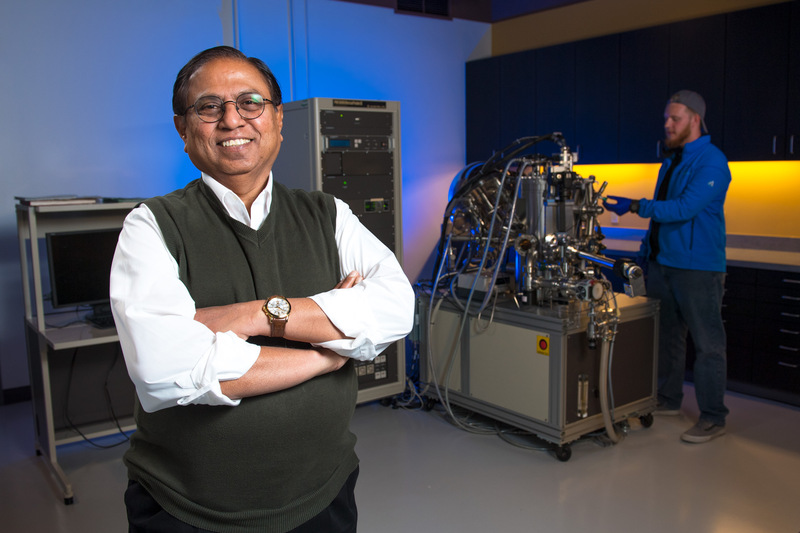 A member of the National Academy of Inventors, Dahotre is internationally known and recognized in his field for his pioneering contributions to the understanding and engineering of laser-materials in processing and manufacturing. Dahotre, a former chairman of the Department of Materials Science and Engineering in UNT’s College of Engineering, has generated funding support for his research in excess of $ $9 million from government and industrial organizations. In his current role as interim associate vice president, he facilitates research projects that have been funded by the federal government, including UNT’s work with the Army Research Office (ARO) and Army Research Lab (ARL) for a tactical shelters project and a ballistics project respectively. He also oversees the management of UNT’s shared instrumentation facilities across campus and works with the advisory groups and directors for each facility. Dahotre has received 16 U.S. patents (another three pending) with one recently in 2016 licensed to Australian Institute of Robotic Orthopaedic (AIRO), has published over 270 articles in professional journals, and is the author of four books and editor of 13 other books that focus on laser-materials processing and manufacturing and surface engineering. He is a fellow of nine national and international societies, including the American Society of Materials, American Society of Mechanical Engineers, American Association of Advancement of Science, American Institute of Medical and Biological Institute, and the Society of Manufacturing Engineers. He also is a founding editor-in-chief of the International Journal of Additive and Subtractive Manufacturing and editor of the Journal of Optics and Laser Technology. Dahotre joined UNT in 2010, and in fall 2016, he earned the Faculty Leadership Award for significantly impacting the academic enterprise of the university through his leadership and service to UNT. Prior to joining UNT, Dahotre had a joint faculty appointment with Oak Ridge National Laboratory and the Department of Materials Science and Engineering at the University of Tennessee-Knoxville and was director, deputy director and a senior faculty member of the Center of Excellence for Laser Applications at the University of Tennessee, Space Institute-Tullahoma. Dahotre earned his Ph.D. in materials science and engineering from Michigan State University, his master’s degree in metallurgical engineering from Michigan State University and his bachelor’s degree in metallurgical engineering from the University of Poona in India.